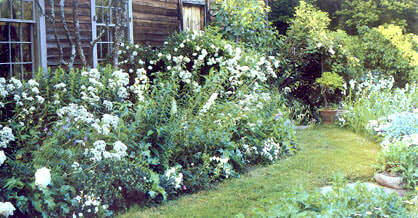 IT WAS AT the Berkshire Botanical Garden in Stockbridge, Massachusetts, that I first met Margaret Hensel. She stoodout in the usual garden group like some exotic flower. She had the looks of a fourteenth-century painting and a delightful exuberance for things horticultural. Needless to say, I was impressed. Over a number of years, she has frequently photographed my garden, so I have come to know her. It was both an honor and a surprise to be asked to write a foreword to English Cottage Gardening forAmerican Gardeners. I thoroughly enjoy Margaret's delight in exuberant gardens, gardens overflowing with the old favorites--hollyhocks, foxgloves, poppies, forget-me-nets, sweet-scented shrub roses, and even vegetables. She lets the reader see, through her words, the pleasing disorder of masses of lady's mantle, pinks, violas, and fragrant sweet alyssum--all spilling over warm brick paths in happy profusion. This book encourages that most rewarding of complaints, Garden Fever. As I read the book this fall, it made me wish to rush out and plant dozens of blue and white campanulas among my shrub roses, along with more dozens of my favorite mignonettes. In my eagerness to put some of the book's ideas into practice in my own garden, I for once regretted the coming of winter's peace. Now, it is a special book that makes a lover of winter long for spring in the autumn!And, kind reader, do you not agree with Margaret Hensel that it is time for Americans to turn more often to lovely flowers in their yards and along their walks, turning away from the dull shrub plantings that one all too often sees? How boring those shrub plantings are! How unimaginative! "Yes," you may say, "but shrubs require no care." Well, nothing truly worthwhile is ever easy. But you will be surprised by joy if you choose to follow the spirit of this book and create a small Eden of your own.